After sewing a ball dress it was with great pleasure that I returned to sewing regular, everyday, wear-a-lot clothes. Especially as my winter wardrobe is still a bit lacking. Burdastyle magazine had an outfit from the 09/2012 issue that I have always loved. Love the 60's vibe, the simple styling, the ease of wear and the comfort factor. 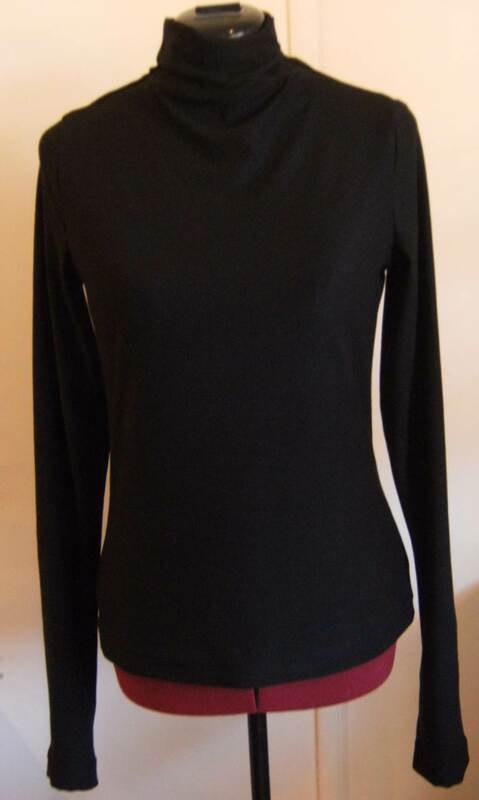 I made the turtleneck top 09-2012-104B. 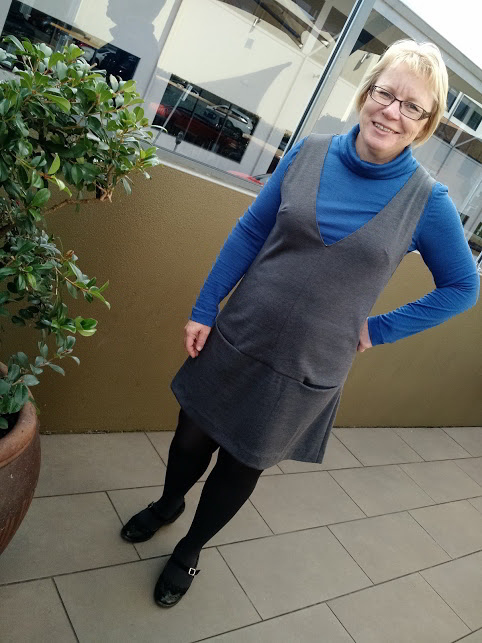 It is the longer version (down to the hips/bottom) and works so well to keep me warm and snug. It also sits well under the pinafore. The fabric is a beautiful merino with a fine stripe from The Fabric Store in Brisbane. I did actually muslin this (not something I would normally do with a knit top) but the merino was so lovely I didn't want to forsake it for a muslin. 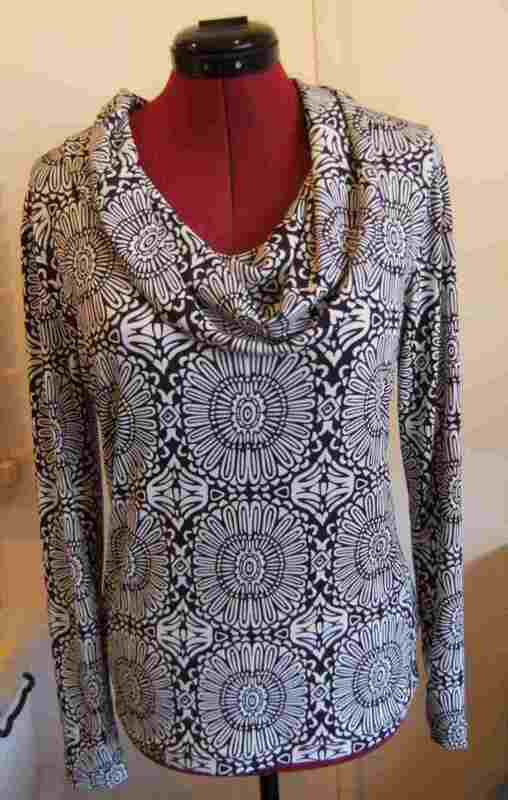 I ended up using the armhole/shoulder width of one size smaller to the rest of the top. I like this turtleneck style. This one is high enough to keep you warm without choking you. I have tried a few over the years. 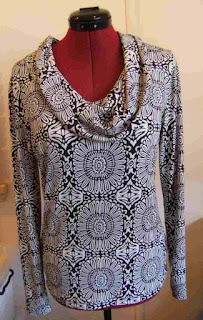 Kwiksew 3740 a great pattern made many times but a too open neckline for a really cold day. Thinking I may have found my ideal turtleneck pattern. 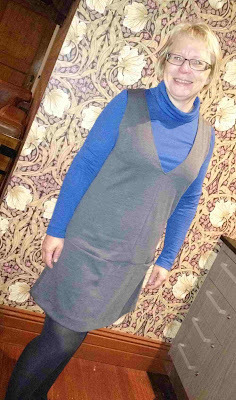 The pinny (09-2012-105) I made from a ponte which was lovely and soft bought from The Sewing Place when they had an offer for cheap shipping. I didn't muslin this but probably should have. I don't think the darts are quite right, but I love it enough that it has already become a favorite in my wardrobe. For the days I don't want to wear the merino turtleneck I have a RTW purple rayon turtleneck that goes with it really well and is not quite so warm. The pockets look a little whoopy in this photo but really don't sit that badly in reality. Very happy with my start to sewing winter wear. Love your 60s pinafore. I had one in purple when I was a teenager. Love the outfit! 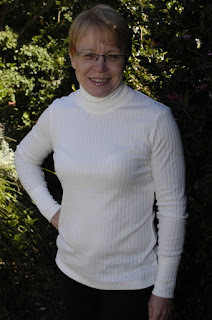 I like turtlenecks too & it can be hard to find one that doesn't chock. Love the 60's vibe. Great outfit. You chose a versatile color for your pinafore. It will look wonderful with so many other colors. Definitely a great start to your winter wardrobe. Happy you found a turtleneck pattern that works for you. I've never seen this pinny made up - so glad I have! I think I need it in my work wardrobe. You need this for the cold snap we are having. Love the open necked version even though it is colder.